Mircea Eliade made this comment in his 1956 Haskell Lectures on the History of Religions at the University of Chicago (subsequently published as Rites and Symbols of Initiation). The qualifier meaningful in Eliade’s statement is significant, because something so fundamental to human societies (across cultures and over time) as rites of initiation do not simply melt into air, modernity notwithstanding. 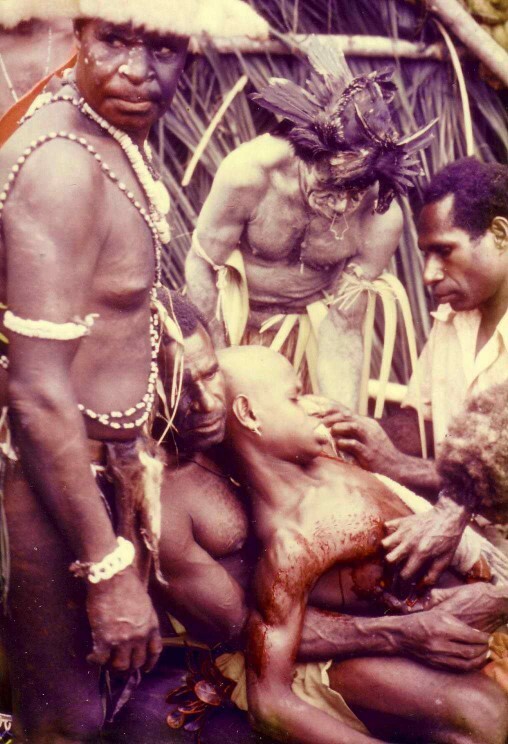 Initiation ritual along the Sepik River in Papua New Guinea in 1975. Photo by Franz Luthi. CC BY-SA 3.0 via Wikimedia Commons. The centrifugal forces of modernity have rendered the initiation that does take place in Western industrial societies more diffuse, haphazard, individualized, and even sometimes only imaginary. In the face of this, some communities are attempting to create or re-create rites of passage that are mindful and intentional. Perhaps not surprisingly, then, less than a decade after Eliade’s lectures, the leaders of the Roman Catholic Church meeting at the Second Vatican Council (1962-1965) called for a restoration of the “catechumenate”—the ancient process for ritually initiating adults. As I noted yesterday, this culminated in the publication in 1972 of Ordo Initiationis Christianae Adultorum, subsequently translated into English in 1988 as Rite of Christian Initiation of Adults. In his work on re-inventing rites of passage, Grimes does not mention the Rite of Christian Initiation of Adults (RCIA), but he could have. In “returning to the sources” in the ancient church for an earlier model of initiation (what French theologians call ressourcement), the creators of the contemporary RCIA engaged in the very process of reinvention that Grimes calls for. Anointing with Holy Oil. Photo by John Ragai. CC 2.0 via Flickr. When fully implemented, the RCIA process takes those considering becoming Catholic on a journey through four distinct periods of formation which are demarcated by three ritual transitions. The opening stage of the RCIA process is intended to introduce individuals to the Catholic faith and to answer questions about it. Also during this period individuals are paired with sponsors, members of the church who will accompany the individual on their journal toward initiation. Those who decide to continue in the RCIA process go through this first of three major ritual transitions. During a liturgy individuals are asked to affirm their acceptance of the Gospel of Christ and the assembly is asked to affirm their support of the candidates. The passage to the status of “catechumen” is then ritually enacted by the priest, catechist, or sponsor tracing the sign of the cross on the forehead (and often also the ears, eyes, lips, chest, shoulders, hands, and feet) of the candidate. Typically held the first Sunday of Lent and presided over by the bishop, this ritual brings together individuals in the RCIA process from the entire diocese so that for the first time the candidates are able to see and experience the church writ large. In this rite, God “elects” those catechumens who are deemed ready to take part in the sacraments of initiation and who affirm their desire to do so. The candidates’ names are enrolled in the diocesan “Book of the Elect” which is countersigned by the bishop who declares them ready to begin their final period of preparation before initiation. This period focuses on spiritual preparation for the rites of initiation and coincides with the 40 days preceding Easter, known as the season of Lent. As part of their spiritual cleansing, the elect undergo three public “scrutinies” which typically involve prayer over the elect and an “exorcism” enacted by a laying on of hands by the presider. The elect are also ritually presented the text of the Nicene Creed and Lord’s Prayer. At the conclusion of this period, the elect undergo the most significant ritual transition: the reception of the sacraments of initiation. This moment of incorporation—literally becoming part of the body of the church—normatively and most often takes place during the Easter Vigil, what Augustine called “the mother of all holy vigils.” In and through this ritual, individuals receive the sacraments of initiation (baptism, confirmation, and eucharist) and in doing so become Catholic. This is sometimes called the period of “post-baptismal catechesis” because it seeks to lead the newly initiated more deeply into reflection on the experience of the sacraments and membership in the church. It is a springboard from the RCIA community to the broader church community. By the turn of the 21st century, more than 80% of American parishes were using some version of this RCIA process to initiate adults. Although it is not yet fully implemented in every parish, the RCIA is the officially recognized liturgical and catechetical process by which adults become Catholic today. As a reinvented rite of passage, the RCIA process has been very successful at bringing individuals into the Catholic Church in a mindful, intentional, and compelling way. As I noted in my first OUPblog entry, it is also helping to shape the process of ritual initiation in other churches. I will suggest in my third and final entry that the RCIA, therefore, represents a bit of good news amid a lot of bad news for the Roman Catholic Church in the contemporary United States. David Yamane teaches sociology at Wake Forest University and is author of Becoming Catholic: Finding Rome in the American Religious Landscape. He is currently exploring the phenomenon of armed citizenship in America as part of what has been called “Gun Culture 2.0″—a new group of individuals (including an increasing number of women) who have entered American gun culture through concealed carry and the shooting sports. He blogs about this at Gun Culture 2.0. Follow him on Twitter @gunculture2pt0.